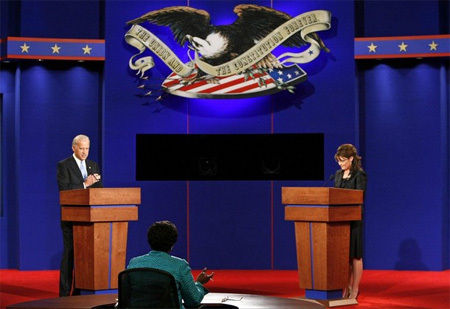 The Sarah Palin VP Debate Spa Style – Should she, would she, or did she? I was over at a friend’s last night pre-debate, and was asked to predict Sarah’s outfit. Funny, everyone thought she would be in red, since she wears it a bit, but I said if I were her I would go for black – it’s my power color and I’m betting it’s hers too. She walked out and bingo, black it was – with some fab burgundy patent pumps to beef it up. (I should have bet cash, darn!) But what did ya’ll think about that flag pin? I found it gaudy and distracting. Funny, a friend once told me to save my big jewelry for after I get the job, not during the interview – now I so get it! Pierce Mattie has a fun Palin v Biden fashion critique. Bling notwithstanding, Sarah carried off a trustworthy, relatable and respectable image last night. I loved her little “Can I call you Joe?” remark to soften him up! Halfway in, frustration was building with her non-answers (see how she won the Governor spot using this technique from a fellow Palin debater) and the peanut gallery remarked how uptight she was. Did you notice her face when her family gathered round though? Hockey mom heaven! Pageant trainers taught me to turn questions into the answers that you want to give – I’m guessing she got the same advice. Obviously Sarah attended to her exterior looks before the debate, but a spa visit would have calmed her interior and helped her presentation, IMO. 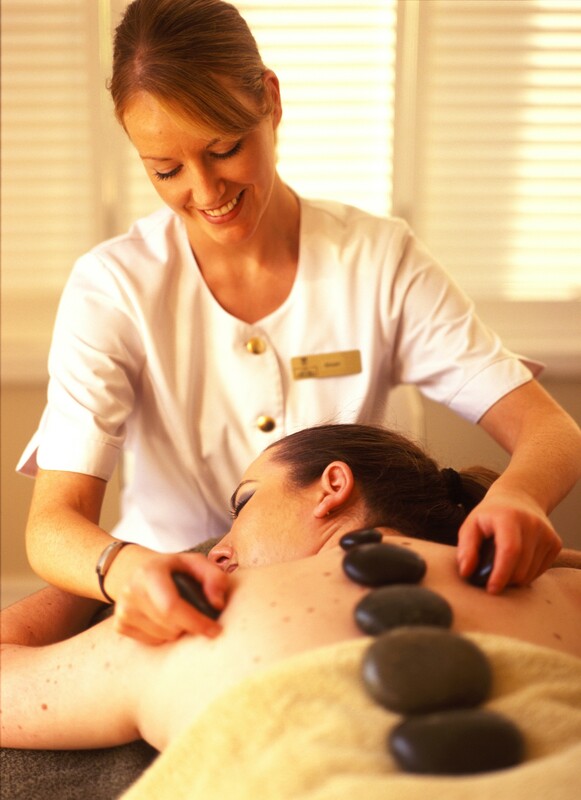 Hot stone massage – to ease her nerves. Since she immediately reverted to her old self after the debate, spa time would be moot, but ya never know – she may have wanted to unwind and booked a spa day. What do you think? Did she or didn’t she spa? Before or After? See you on Saturday for Part 2 of Where Would Sarah Spa? Post Debate Edition.